My goodness!! I am so excited after finishing this book! I pretty must wanna write, “GO READ THIS!” and just leave it at that, but I won’t. I’ve been told by quite a few people that this book is super fun and intriguing, and will keep you on your toes. And they were so very right. I had so many theories as I was reading. It’s hard to know what’s going to happen when you’re told not to believe anything to you see or hear. Scarlett and Tella have grown up under the evil hand of their father. In fact, his scenes had me wincing quite a bit. Evil is an understatement. 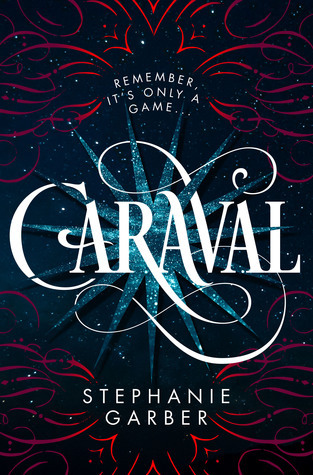 But the girls have a chance to run away to Caraval for a few days and escape their life, before Scarlett is forced to marry someone she’s never met. But things don’t turn out the way that they hoped. The game has a way of changing you, if you’re not too careful. When Tella is kidnapped, the game gets more real. Scarlett must rely on the help of Julian, the sailor who seems to have an ulterior motive behind his actions, in order to rescue her before the five days is up. Scarlett has always done what needs to be done, in order to protect her sister, so this will push her far beyond her imagination. As she spends more and more time with Julian, she starts to question everything about him. Romance has no place in this game. By the end, no matter what her feelings are for Julian, it’s all about her sister. Scar will do whatever it takes to find Tella and escape their father. I hope you do. And if so, I hope you like it as much as I did. It’s definitely on the list – I just need to shift a few more of the books I’ve recently acquired, first!